Francis was born in Sioux City, Iowa, on June 16, 1922. As the Depression took its hold on America, her family moved to Los Angeles when she was 9 in search of work. Rafferty had a gift for dance, and won a scholarship to the Edith Jane Dancing School the next year. 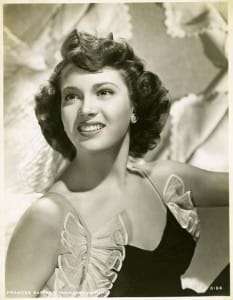 She attended UCLA following her high school graduation but soon dropped out after earning an understudy position for dancer Vera Zorina in the film “I Was an Adventuress” (1940). Rafferty soon changed her focus to acting after breaking a kneecap from a fall during a performance at the Hollywood Bowl on the concrete stage. Months of recovery awaited. The execs at MGM signed Rafferty at the age of 19 and her Hollywood career began with a bit part in “The War Against Mrs. Hadley” (1942). She got a dancing role in “Presenting Lily Mars” (1943) starring Judy Garland. She also turned heads with her small role in the Rooney and Garland musical, “Girl Crazy” (1943). So, MGM was good to her, giving her other parts in the Wallace Beery vehicle, “Barbary Coast Gent” (1944) and “Mrs. Parkington” (1944), starring Tay Garnett, Greer Garson and Walter Pidgeon. Rafferty became known for her exotic beauty and she capitalized on it in “Dragon Seed” (1944), playing the unfortunate Oriental girl who is raped and murdered. Rafferty became a famous war-era cover girl for YANK, the Army Weekly but as hard as she tried, she was unable to attain major starring roles in “A” pictures. She continued in Hollywood, remaining a “B” level co-star, best remembered as the pouty glamor girl. She received star billing in “Abbott and Costello in Hollywood” (1945), one of the first full-length features starring the two comedians and was convincing in the entertaining mystery, “The Hidden Eye” (1945). After World War II, Rafferty acted in only a handful of films like 1947’s comedy, “Lost Honeymoon, Curley” (1947), as a tormented teacher of the Little Rascals and 1948’s “An Old-Fashioned Girl” (1948). Sadly, Rafferty’s career had become less significant as the 1940’s came to a close. In 1948 she married Thomas R. Baker, an Air Force colonel who later became general manager for the Los Alamitos Racetrack, and had two children. Frances Rafferty died in her sleep at her home of natural causes on April 18, 2004 in Paso Robles, California.